Green Curry Sauce! 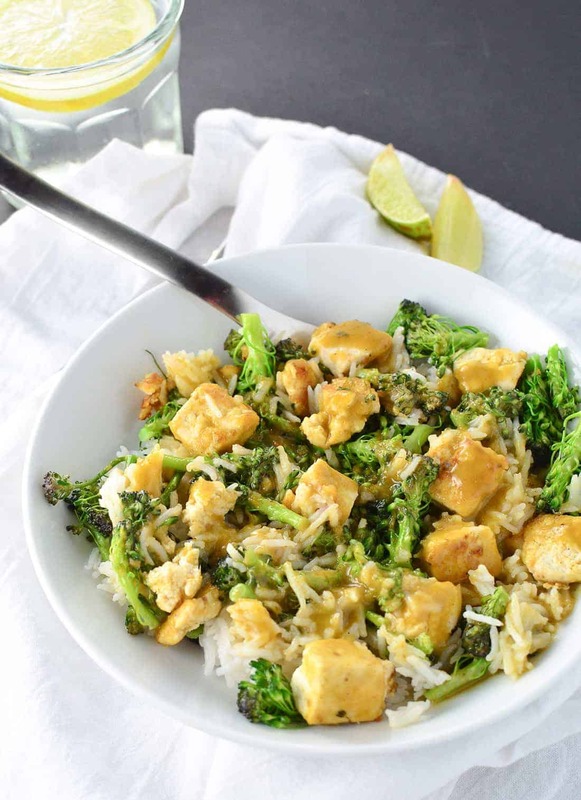 A 15 minute spicy, delicious sauce that’s perfect over vegetables, noodles, rice, tofu and more! A giant bowl of green food! Perfect for St. Patrick’s Day…which, I’m aware, happened two days ago. But, then the Academy decided to fall off its rocker and partner with Kraft cheese so this post got pushed back. Venting from my soapbox first, green food second. So, let’s pretend it’s still St. Paddys! Break out the car bombs and Guinness cupcakes- it’s showtime! I’ve lamented previously over my love for Thai-flavored everything; a craving that’s only intensified over the last several years of living on the West Coast. I took BL to San Francisco last week to see the musical production of his favorite movie Newsies as an early birthday present. Since we go to SF fairly often, we’ve got a rotating list of favorite restaurants that we hit up depending on our mood. I was craving Thai last week so we headed to a restaurant that we both love but hadn’t been to in years. Known for their killer mojitos and currys, I was excited to stuff my face with eggplant green curry and cocktails. Sadly, our dinner was a D+ at best. My curry was so flavorless that I could barely eat two bites of it. So, into the kitchen I went last weekend to restore my faith in green curry. After making my red curry peanut sauce last winter, I’ve been using it over and over again to top rice, pasta, steamed vegetables and sweet potatoes. So instead of creating a green curry dish, I decided to go with a sauce that I could use similar to my red creation. Because, sauce. You guys know how I feel about my sauces and how much I love pretty much everything covered in some type of drippy, slurpy sauce. This green curry sauce is all that and more. What I love most about this sauce is how thick it is, perfect to sneak into all the nooks and crannies of broccoli florets and a pile of steamed rice. For added protein, I decided to quickly fry up some tofu to give this dish more staying power. I made my sauce while the broccoli was steaming and the rice was cooking. After pressing the tofu, I cubed it and tossed it with corn starch and lightly sauteed it in a cast-iron pan. It’s my way to get crispy, golden tofu cubes without using a lot of oil. Pile everything into a big bowl and cover with sauce- and dinner is ready in just 30 minutes. Green Curry Sauce! 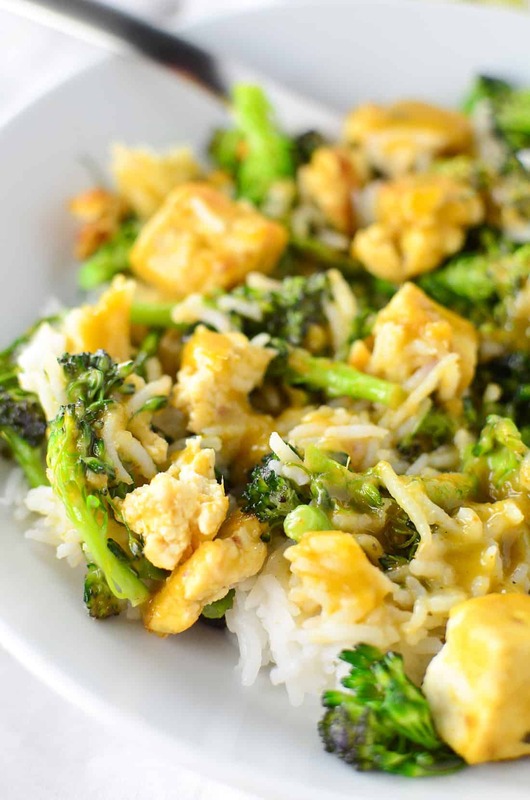 A 15 minute spicy, delicious sauce thats perfect over vegetables, noodles, rice, tofu and more! Place the can of coconut milk in a medium saucepan and bring to a gentle simmer over medium-high heat. Stir occasionally to prevent scalding. Once the milk is hot, whisk in the curry paste, soy sauce, lime juice, brown sugar and minced garlic clove. Keep whisking over medium-high heat for 15-20 minutes until sauce is thick enough to coat the back of a spoon and reduced by almost 1/2. The longer you cook it, the thicker it will be! You can also thin out the sauce with a little water/vegetable broth if you want it thinner in consistency. 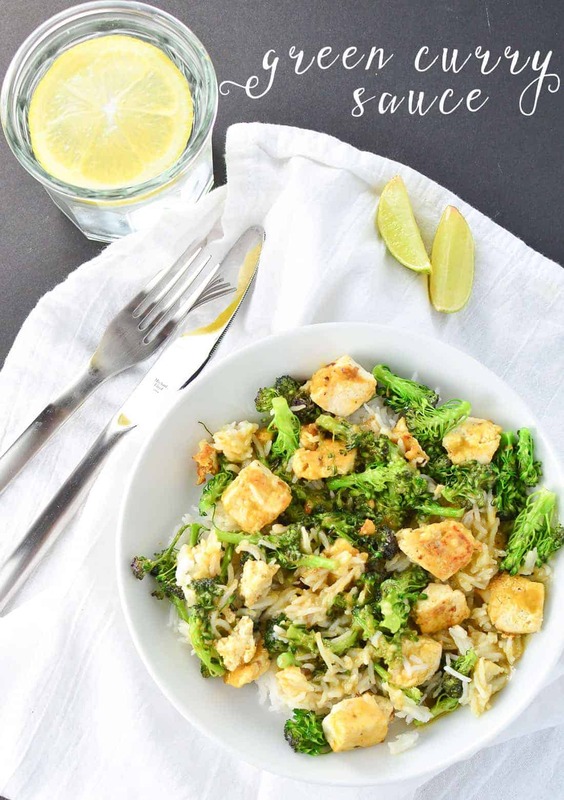 While this sauce is delicious over just about anything, I love it with steamed vegetables, rice, and pan-fried tofu. *Depending on the curry paste that you use, you may need to add a minced thai pepper for more heat. I used a vegan brand that I got at my local asian market which had a lot of heat! However, I made the dish again using Thai Kitchen brand and it needed more heat. I added a finely minced thai pepper to add heat and it was great! So, adjust as needed. 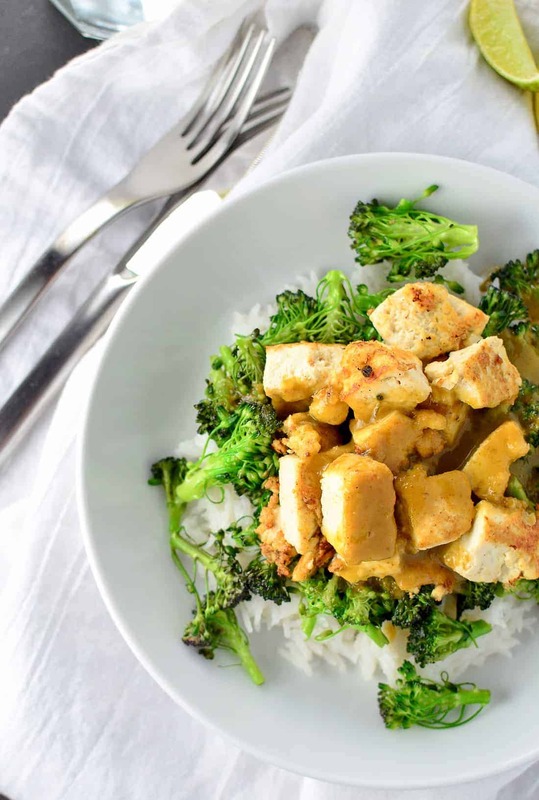 I would love to have this green curry any day of the year- it looks phenomenal! I’ve alway preferred green curry over red so this is right up my alley! I always love making green curries at home. This looks soo delicious! Curry? Vegan? When should I stop by? Green curry is one of my absolute favorites, but for some reason I’ve never made it at home (only red). I am literally drooling over here. Can’t wait to make this! Yum! I love a good curry. I like to put peas in mine! Can green curry sauce be frozen? I haven’t tried it but you should be able to freeze it. However, it may naturally separate so you’ll want to reheat it before serving again and you may need to add additional seasonings/coconut milk depending on the texture.